Castrol Hyspin AWS/AWH varieties: Castrol Hyspin AWS 32, AWH 45,AWH68, AWS68, AWS 100 is a high quality mineral oil based hydraulic fluid with anti-wear, anti-oxidation, anti-foam and anti-corrosion additives. Castrol Hyspin AWS 100 is a high quality mineral oil based hydraulic fluid with anti-wear, anti-oxidation, anti-foam and anti-corrosion additives. Also suitable for lubrication of vacuum pumps in dairying and associated industries. Hyspin AWS 100 is suitable for gear, vane and piston type hydraulic pumps not containing silver or cadmium. It is also suitable for lubrication of vacuum pumps in dairying. Recommended for equipment operating under medium to severe operating conditions. Contains anti-wear additives: improved reliability and extended pump life. Additives to provide protection from wear, oxidation, foaming and corrosion: reduced downtime. Multipurpose fluid: reduces inventory on farm. 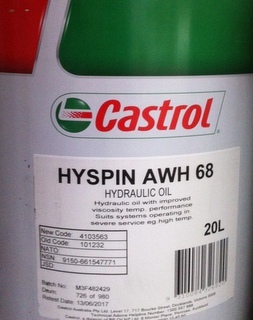 Castrol Hyspin AWS 100 is suitable for use where a non-detergent, SAE 30 or ISO 100 viscosity oil is recommended.